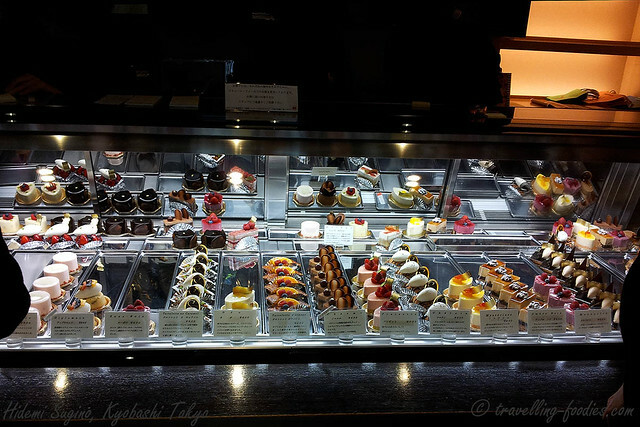 Yes, finally we begin the reviews on our visits to Pâtisserie Hidemi Sugino. 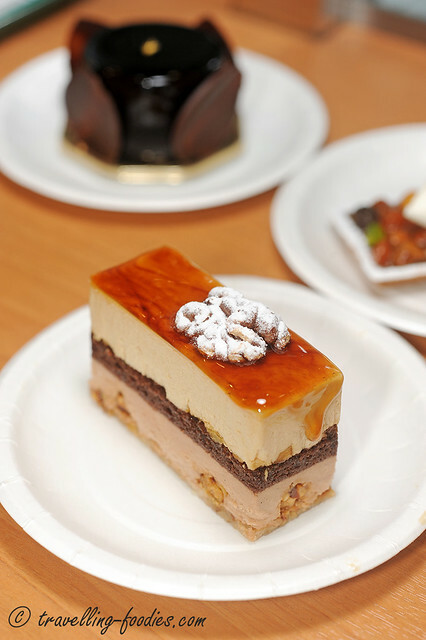 If you are familiar with French pastry, Hidemi Sugino is a name that hardly needs introduction. 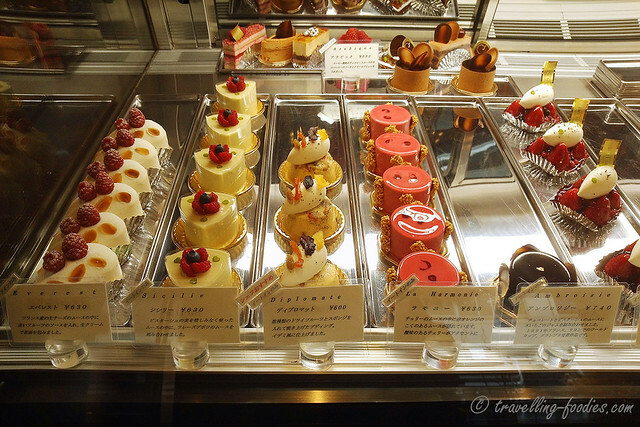 And I would dare say that you do not know French pastry until you know Hidemi Sugino. 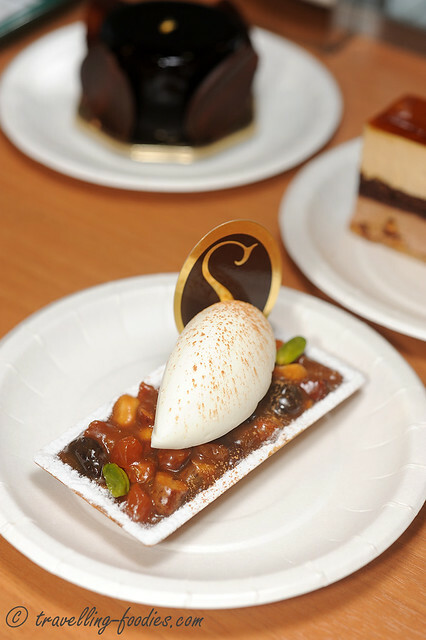 Trained and apprenticed at Patisserie Peltier (now defunct) in France and most noted for winning the prestigious Coupe de Monde de la Pâtisserie back in 1991, he quickly became the spotlight upon returning to Japan, first opening an atelier and patisserie in Kobe before starting his own dessert boutique in Tokyo. Since then Hidemi Sugino created a wave of sensation within the Japanese gastronomic scene, attaining popularity like few had before him, with a strong and loyal following of fans and dessert aficionados both locally and abroad. 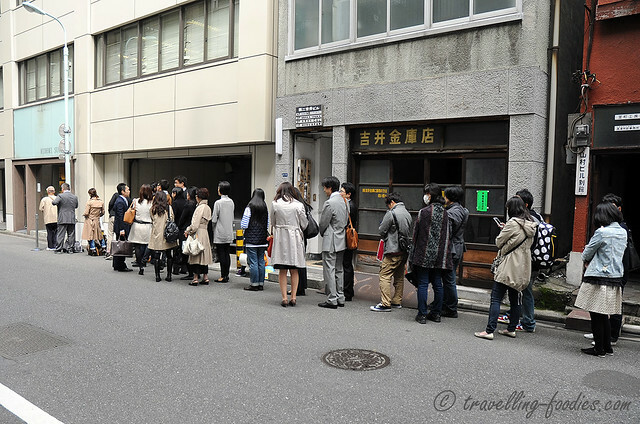 A daily sight before opening hours outside his dessert boutique in Kyobashi Tokyo. On a good weathered day, the queue can develop several doors down the road, everyone waiting quietly in an almost pilgrimage-like fashion to worship and be overwhelmed by the creations from this pastry grandmaster with an almost cult like status. Finally the doors open, with the first round of diners ushered into the shop while the rest of us wait eagerly outside for our turn. As I got progressively nearer and nearer to the door, I could hardly contain the excitement brewing and bubbling within, stealing peeks through the glass display to see what was available, what the others had ordered, uttering a silent a prayer that what I want would still be available when it is finally my turn. If the shop front is the entrance of the temple, then surely the chiller display must be the altar of worship. Sure enough, as one stands before this magnificent spread, one could not help but be in awe by the sheer beauty and sublime elegance exuded through his creations. Now I can truly say I know what it feels like to be in pastry heaven. Everyday, a good selection of petite gateaus and sliced entremets would be available, fresh out of the kitchen located just above the shop. We counted 23 different cakes! These creations are divided into 2 groups. On the left of the display runs a limited number of 6-7 items which can only be sampled and enjoyed within the shop. 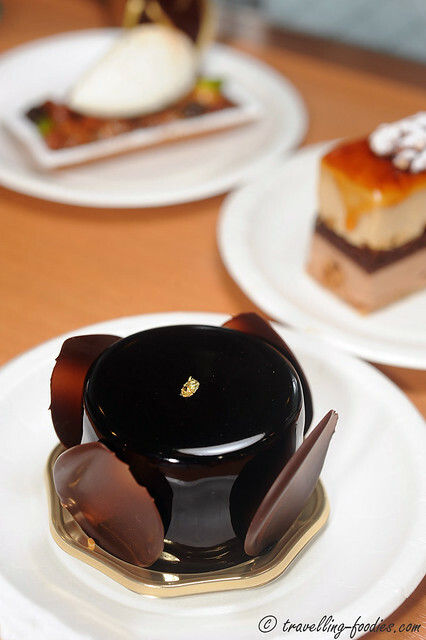 Hidemi Sugino is most known for his artistry in the making of mousse cakes. The delicate textures in the mousse he is able to achieve owes much to the use of premium ingredients as well as very limited use of gelatine as a gelling agent. Because of this, many of these creations are very “fragile” and temperature sensitive, difficult to hold together and maintain their pristine state once out of the chiller display for long and thus must be consumed quickly. In order to preserve and uphold the integrity and quality of his creations, and also to ensure that his diners could be able to fully appreciate the true mastery of these pieces, takeaways for these 6-7 items are strictly prohibited. One should also note that while you may be tempted to order the full repertoire of cakes available, there is actually a limit to the number of pieces one could order. 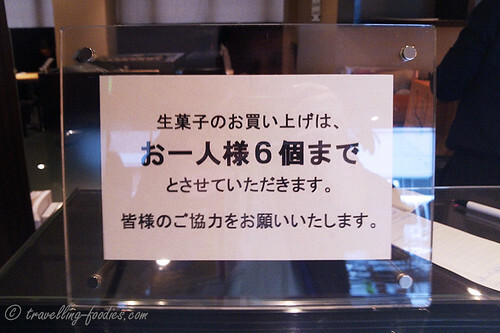 Every diner is allowed no more than 6 pieces from the chiller display. I’m guessing that this is to make sure that any particular item do not run out too quickly, to the dismay of diners who continually stream in throughout the day. Well I can only say that the early bird catches the worm. Be sure to come early and queue to avoid disappointment. Photography is also strictly prohibited within the shop. 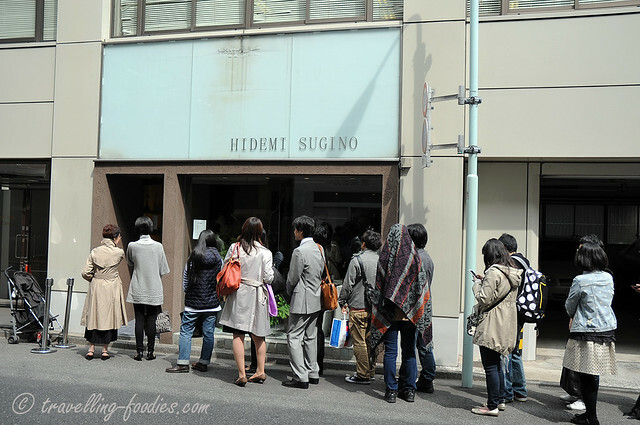 Most pastry shops in Japan seem to impose this regulation and Hidemi Sugino’s is no exception. Do not be tempted to point your big arse DSLR at the display. The waiting staff would approach you with lightning speed, as if they had received precision training to do so, and you would be halted promptly. The ambience of the dine-in area is also rather tranquil and serene. Soothing piped in music with the incidental clink-clank of cutlery is probably what you can hear around you mostly, apart from the whisper chatter of the ladies in the next table, accompanyingly repetitive “so desu ne” and hardly repressible giggles as they customarily cover their mouths with their palms and nod repeatly in an almost orchestrated fashion. Photography of the pieces which you had ordered and brought to your table is slightly more tolerable it seems with the dexterity of current smartphone cameras in silent modes. But the waiting staff always maintained a watchful eye over the diners, constantly attentive to their needs, and of course would approach your table without hesitation once they heard the click of the camera shutter to stop you immediately. Attempting to do so would be most embarrassing, unless you were granted special permission to take photos that is! 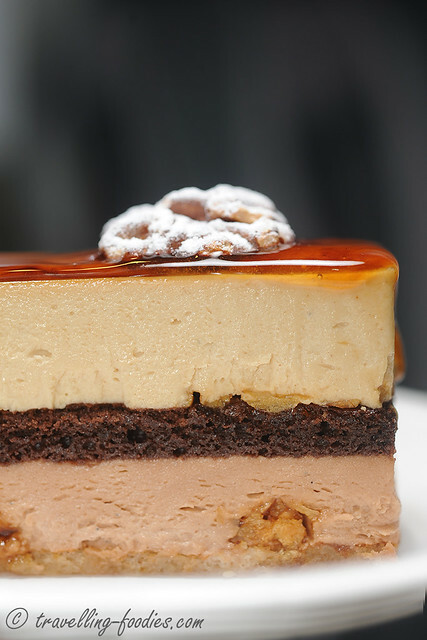 A simple sliced entremet with a biscuit au noix as the base building up two layers of mousse au chocolat au lait followed by mousse au caramel with a layer of biscuit joconde au chocolat sandwiched in between, The cake is then robed with later of caramel glaze and a piece of toasted and lightly candied walnut. A very simple piece but so full of earthy richness in the taste but in a non-obtrusive manner. Richness can sometimes be overwhelming and jarring but we had none of that in Ambre Noix. The bits of caramelised walnut nougatine embedded within the lower milk chocolate mousse layer, together with the toasted walnut decor on top added a lovely crunchy textural dimension against the smooth and coaxing textures of the mousse. And the aroma… boy o boy the aroma from the toasted nuts just linger on and on in the mouth and up the nasal cavity. Again, a piece with a very simple composition but incredibly delicious. 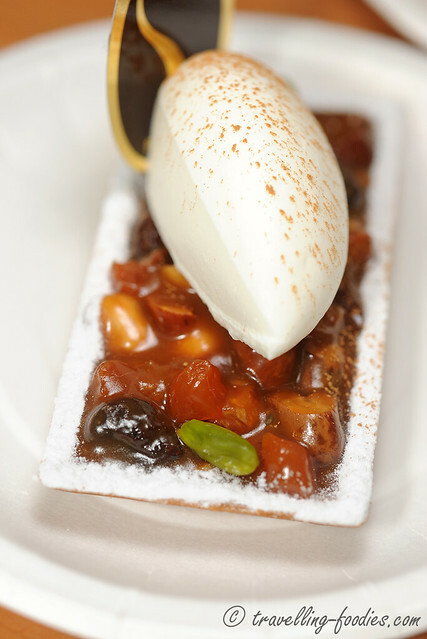 Using pate sucree as a base, the perfectly baked sweet pastry crust is filled with an assortment of toasted nuts like almond, hazelnuts and walnuts, as well as dried fruit like apricot, raisins and cherries, mixed with Crème Caramel. This is minimally but elegantly decorated with a perfect quenelle of of Crème Chantilly. The flavours are really beautiful as they have been pushed to the extremes. The caramel sauce exudes a rather prominent profile of bitterness and that actually helped to accentuate the nutty aroma of the assortment and innate sweetness of the dried fruit used. 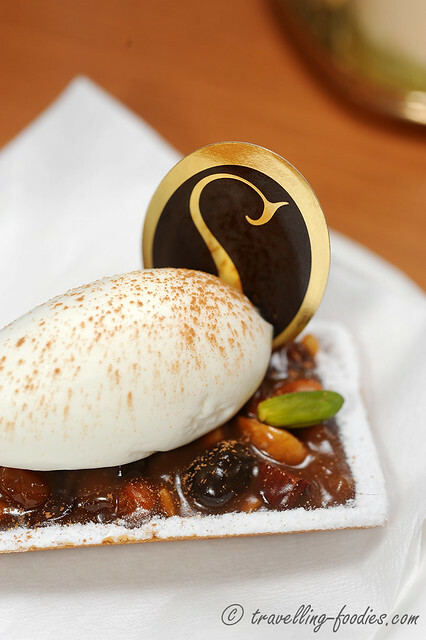 Also used to balance the sweetness is the snow powder which had been dusted around the perimeter as well as the quenelle of pastry cream on top. The one piece which everyone is dying to try at Hidemi Sugino’s. It is the most expensive cake in the display but being the most popular, it is always the fastest to sell outm usually within one hour from the shop’s opening. 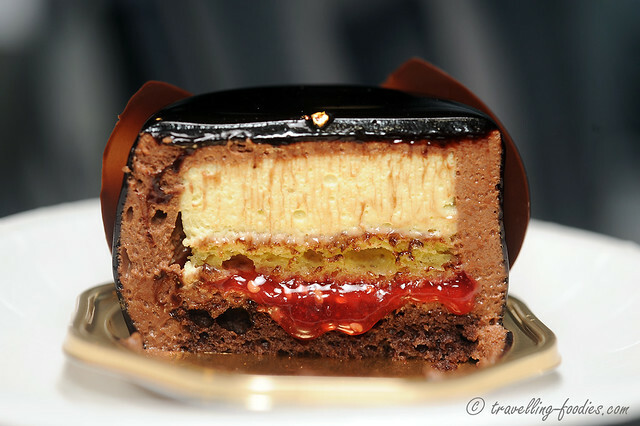 It is a multi-component petite gateau, starting off with a biscuit joconde au chocolat as the base to provide support for mousse au chocolat noir which has layers of framboise pepins, biscuit au pistaches and a mousse a la pistache in between. 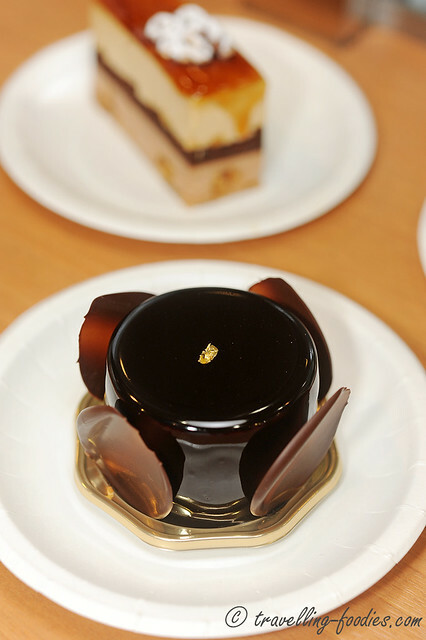 The whole piece is then robed with a glacage au chocolat and decorated with some chocolate pieces and gold leaf. Note-taking while we sampled along, with a writeup on the various pieces they are showcasing for the Winter 2013 collection. Their menu changes according to the season as Sugino-san incorporates seasonal ingredients into his creations. But some signatures like Ambroisie are staples in the shop available all year round. Visiting Sugino was most certainly one of the highlights of our Tokyo trip, making multiple visits back to the shop throughout our week-long stay. To find out more on the other pieces which we’d tried from his vast repertoire of pastry creations, look out for our future installments on him! This entry was posted on July 19, 2013 by Alan (travellingfoodies). 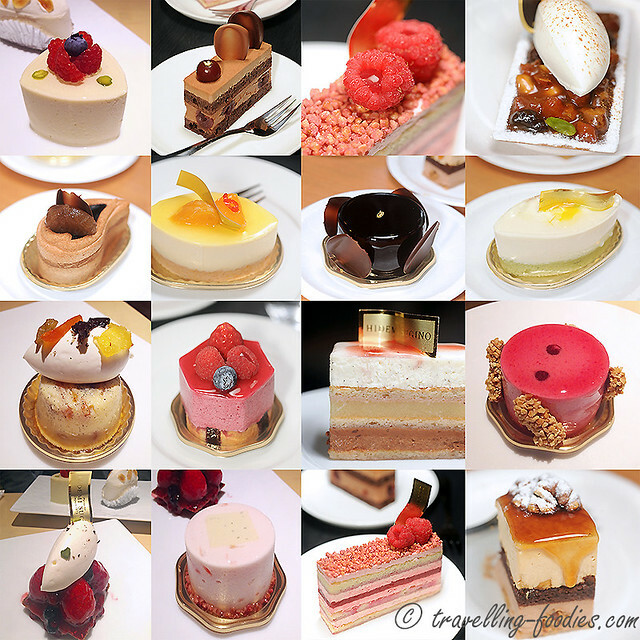 It was filed under Food, Travel and was tagged with ambroisie, Ambroisie アンブロワジー, coupe de monde, french pastry, hidemi sugino, kyobashi, noix, nuts, pâtisserie, pistachio, Sugino, Tartlette au Caramel, 杉野英実, 杉野英實, 京橋. 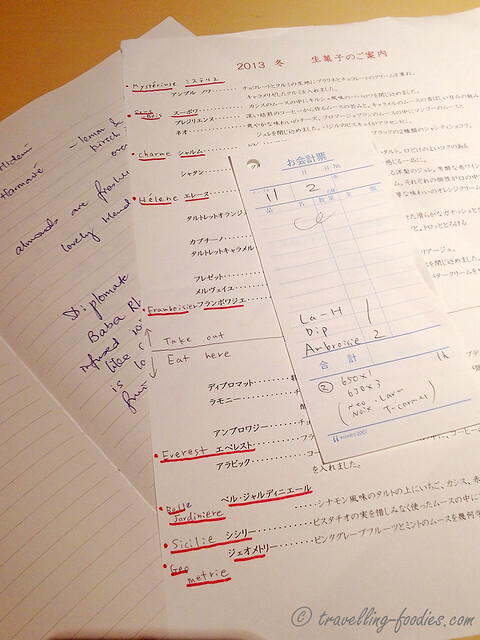 OMG, you soooo made me want to go back to Tokyo now! These look amazing! How I hope someday I can have something like that back home! go before 9.30 am to secure yourself a place. Ambroisie sells out very fast. I was told within an hour after opening.